New types of mosquitoes are constantly on the move and with them come the threat of new diseases. That is why a critical component of the Contra Costa Mosquito & Vector Control District's effort to protect public health is to watch for new mosquito species and work to prevent them from establishing a presence within the county. Today, the District's surveillance and control program is more important than ever because a new mosquito species has landed in two nearby counties, prompting District employees to work harder than ever to make sure this new mosquito doesn't establish here. According to the Mosquito & Vector Control Association of California, public health employees in Madera and Fresno Counties have detected the Aedes aegypti mosquito which is also known as the yellow fever mosquito because it is a primary transmitter of the disease. It can also transmit other mosquito-borne illnesses including dengue fever and chikungunya; and the potential risk could be greater with this mosquito because of the globe-trotting nature of many California residents. "This mosquito actually gets yellow fever directly from infected humans, so Aedes aegypti can easily spread disease from person to person," says the District's Scientific Programs Supervisor Steve Schutz, Ph.D.
"And because many people travel between the Bay Area and parts of the world where yellow fever, dengue fever and chickungunya are endemic every day, if we had that mosquito here, the risk of mosquito-borne illness would definitely increase." Even without the Aedes aegypti, Contra Costa County is already home to 23 types of mosquitoes including two types that are very efficient at transmitting West Nile virus. Culex pipiens and Culex tarsalis mosquitoes are native to the county and are the principal transmitters of West Nile virus. 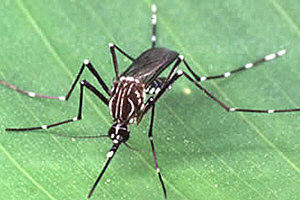 However, pipiens and tarsalis mosquitoes cannot spread West Nile virus directly from human to human. They must first acquire the disease from infected birds. The ease with which the Aedes aegypti can transmit disease and the mere 120 miles between Madera and Contra Costa Counties are causes for concern. The effort to keep new mosquitoes with new disease risks from migrating throughout the state is a war waged by California's Mosquito and Vector Control Districts every day. For two years, public health employees in Southern California have been working to prevent the Asian tiger mosquito from traveling from its last known location, approximately 350 miles from Contra Costa County. The Aedes albopictus is capable of spreading dengue fever, which is also known as "bone break fever" because of the pain associated with the disease. It is also a disease spread from human to human by this mosquito, making it another mosquito we definitely don't want in our county. "Diseases that mosquitoes can easily spread from human to human are much more likely to become an epidemic than those that require an intermediate host like a bird," says Schutz. "That's why the trapping, inspections and overall surveillance we do today to try to prevent these new mosquitoes from establishing themselves is so important because preventing a mosquito is easier than controlling it later."